Can the full body workout you recommended for middle-aged women with minimum equipment (home gym) also be adapted by younger women who may want to achieve a more of a fitness look? Can it be tweaked to be used in a gym with more available equipment to provide maximum cosmetic effect for minimal time investment? Maybe not fitness competitor but approaching that look if that is even possible on a minimal training program. A lot of this is out of personal interest. I'm naturally muscular so probably can get by on a minimal amount of weight training and spend the rest of my time on cardiovascular exercise. On the other hand, other individuals find a fitness facility either too intimidating or consider the trip to to the facility too inconvenient, particularly if it is greater than 15 minutes away. In this case, exercising at home is certainly an advisable compromise. Each case will have to be assessed to determine the most suitable program strategy. There will always be a compromise between what may be recommended and what the individual is willing to do. Also see Exercise & Sports Psychology Tidbits. The process of toning involves restoring as much muscle as losing body fat. Since muscle is denser than fat, individuals who tone may not lose weight, but appear slightly smaller and consequently more fit looking. Conversely, weight loss involves losing more fat than gaining muscle. I believe it is more difficult to achieve the fit look without a combination of weight training and appropriate dietary practices. Those that can achieve this look without implementing these components are most likely already, or naturally not far from this ideal body type. Whatever cannot be achieved through dietary restrictions will have to be achieved through caloric expenditure, which will take a lot of time and effort. Although women appear to tolerate a high volume program better than men, I encourage you to see how you respond to a low volume program involving the least number of weight training exercises with the fewest number of sets, particularly with the goal of toning or weight loss. For one, greater intensity can be achieved with an abbreviated weight training program. See low volume training. While aerobic exercise will burn fat during exercise, anaerobic exercise, like weight training and sprints, can continue to burn fat for hours after exercise. It seems the intensity of the anaerobics is the primary factor in sustained metabolism hours after exercise. The article you shared with me regarding HIIT was very informative and illustrated this concept nicely. 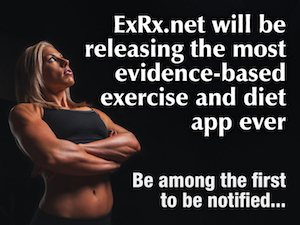 I have summarized the HIIT study on ExRx.net. The combination of weight training and aerobics appears to be more effective in fat loss as compared to only performing weight training or aerobic exercise alone, even at the same caloric expenditure. See Resistance Weight Training With Endurance Training Improves Fat Loss. That being said, most people overestimate the amount of cardio required to achieve a body transformation and underestimate the importance of diet. Weight training is also an important component. It has also been theorized that an increase of muscle mass may enhance our ability to burn fat. Weight training exercises that utilize the greatest muscle mass has the most potential for fat loss through both an increased metabolism via anaerobic exercise and an increased muscle mass. However, any increase of metabolism due to gains in muscle mass are likely countered by subtle metabolic decreases during dieting. This is why it is important to keep calories as high as possible, yet to a point where you can still lose body fat (see developing a diet). For individuals attempting to achieve fat loss for aesthetics, the intensity of weight training can be a double edge sword. When beginning an exercise program, muscle mass increases may out pace fat losses, resulting in a small initial weight gain. Significant fat loss requires a certain intensity, duration, and frequency that novice exercisers may not be able to achieve until they develop greater tolerance to exercise. If an exercise and nutrition program is not adequate for significant fat loss, a lighter weight with higher repetitions could be implemented to minimize any muscle building effects, although less fat may be utilized hours following weight training. If an aerobic exercise and nutrition program is sufficient enough to lose fat, a moderate repetition range with progressively heavier weight will accelerate fat loss with a toning effect. If the development of a muscle group out paces fat loss, the bulking effect is often only temporary since additional calories can be expended as the body becomes more conditioned. Alternatively, if the weight training exercise(s) for that particular muscle can be ceased altogether, the amount of fat loss is not adequate to counter the development of the particular muscle groups. The muscle will then atrophy to a pre-exercise girth within months. Higher repetitions training may be later implemented and assessed. Also see other Women's Weight Training questions and answers.